You’ll enjoy some of the best views on Koh Rong from Happy Elephant’s hillside bungalows, or head to their new hotel. If you don’t mind stairs, Happy Elephant’s bungalows have some of the best vistas on the island. 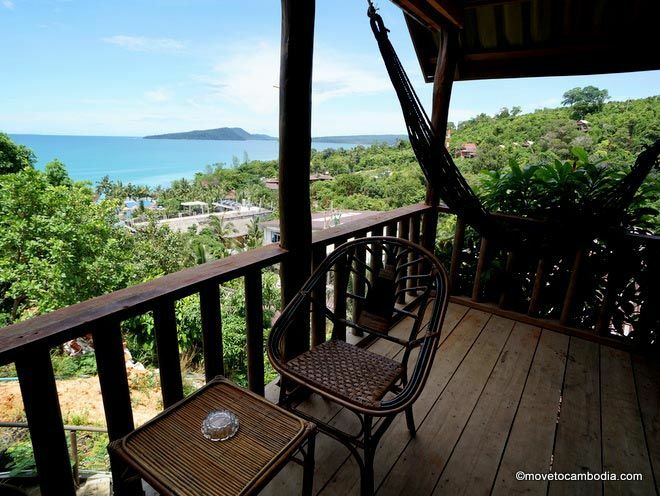 Their bungalows snake up the mountain, giving an unparalleled view of Koh Rong’s bay, jungle, and impending development. Located up a laneway in Koh Toch Village, Happy Elephant has both a hotel and bungalows, each with their own unique charm. 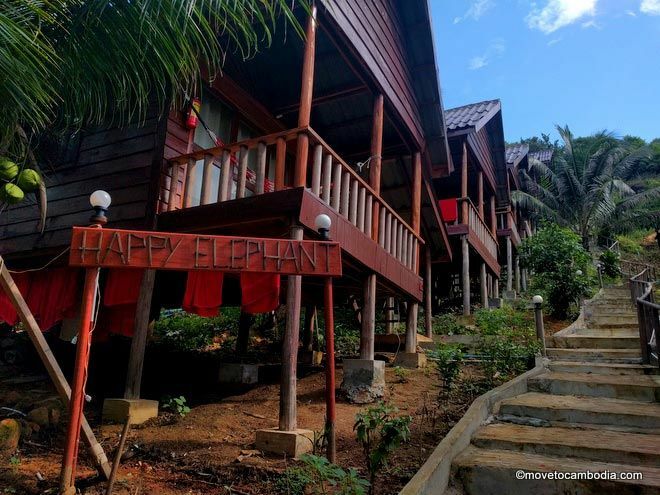 Each of Happy Elephant’s seven bungalows has two beds, one a double, the other a semi-double, in other words a glorified single. Each bed has a mosquito net, although there are fewer mosquitoes this far up the hill than down in the Koh Toch trenches. The view from one of Happy Elephant’s hilltop bungalows. 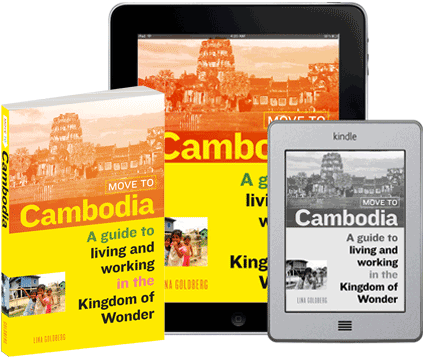 The bungalows are wooden and have a ceiling fan and a cool-water shower (that is, room temperature, which is decidedly not cold in Cambodia). Each bungalow has sliding glass doors that open onto a private balcony with rattan chairs and table and a hammock to laze in while soaking up the view. 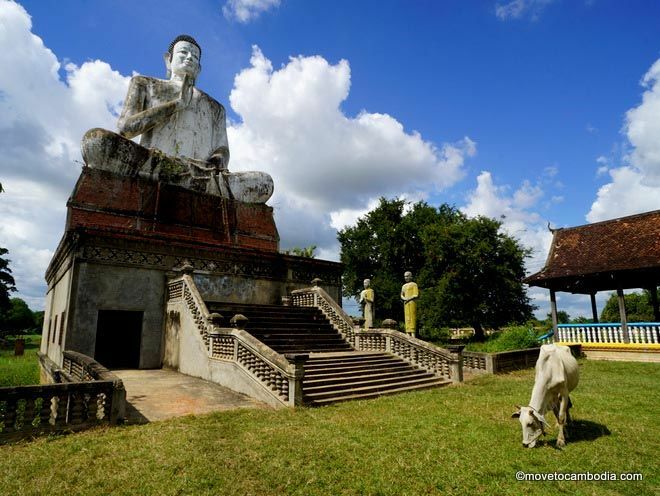 As mentioned, the highest bungalows are a bit of a hike up the hill, but the journey up and down will only make you appreciate a dip in the sea all the more (the steep stairs are also good for the calves). Some bungalows are closer to the street level, though, so if you’re willing to sacrifice the stunning views, request one of those when you book. Inside a Happy Elephant Bungalow, simple and clean (and don’t get us started on the views). Happy Elephant also owns a brand-new hotel with a rooftop bar — you can tell these guys are serious about beautiful views. The bar is the only place you can catch a WiFi connection, but it’s no problem to hang out there with your laptop, although the island internet is still notoriously unstable. At the time of writing, hotel rooms are new and freshly painted with pristine white sheets. If you’re trying to escape the mosquitoes, this sort of room — fully sealed and concrete — is what you are after, rather than a bungalow. 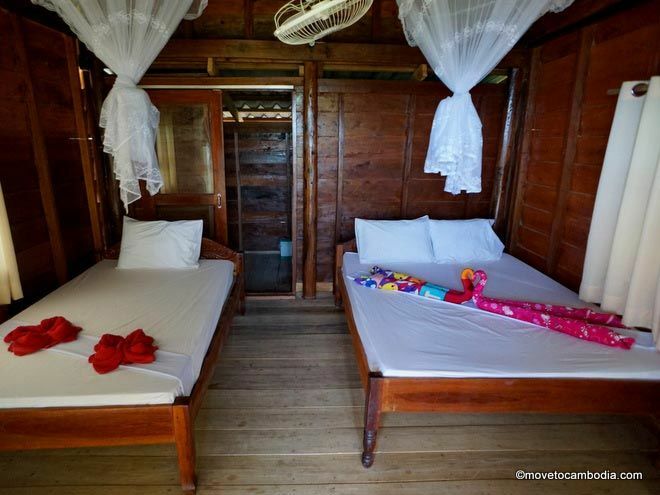 Rooms have either one double bed or two twin beds and are fan-cooled with a cool-water shower, although we predict that as Koh Rong develops their electricity supply, these rooms will end up with air-conditioning. New hotel rooms at Happy Elephant, for when you are all bungalowed out. Bookings are available online, either through their Facebook page or on Booking.com or Agoda.